The Garden Spot Village 1/2 Marathon has teamed up with the Bird-in-Hand 1/2 Marathon. Run the Garden Spot Village 1/2 Marathon in April plus the Bird-in-Hand 1/2 Marathon in September and you will be presented with the Road Apple Award. You must complete both races in the same calendar year. If you’ve run with us before you know that Amish horse and buggies are a common sight along the course. 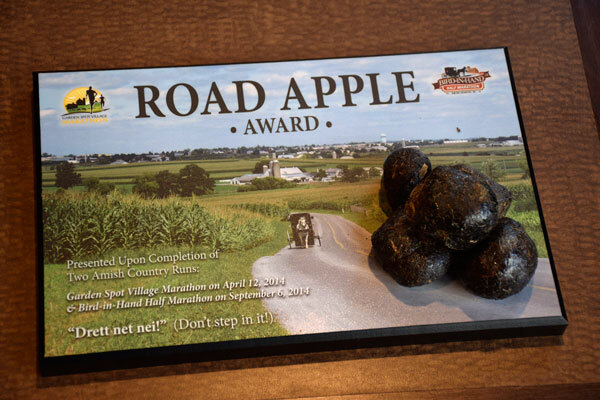 The Road Apple Award celebrates this unique aspect of Amish Country running. The Road Apple Award comes with genuine, sanitized, purified, petrified road apples mounted right on the award. You won’t find another award like it anywhere else. It’s one of the most intriguing trophies around. Come run both races, one in the spring and one in the fall, and get an award like no other!